Pre-game Ep1: "I Need Redemption" Ep2: "He Has Demons" Ep3: "Reap What You Sow"
After helicoptering in to meet the assembled newbies, and picking paint-filled eggs to select their tribes, Ozzy and Coach have to compete in a 'hero challenge.' 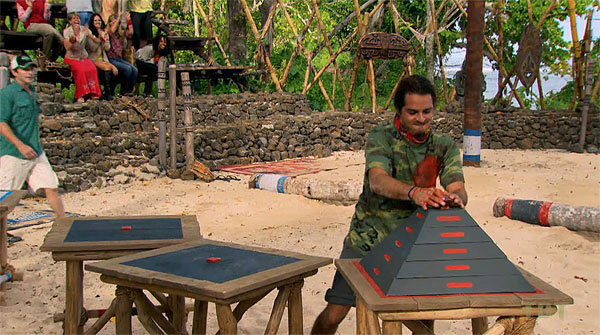 Ozzy beats Coach at a tower puzzle as both tribes watch. Savaii wins fire and taro. 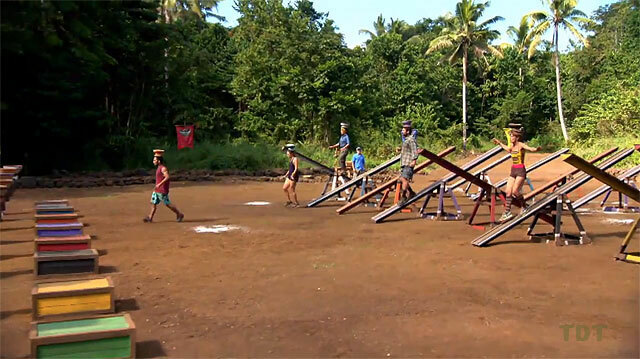 Each tribe runs through a criss-crossing obstacle course, then over a 10-foot barrier. 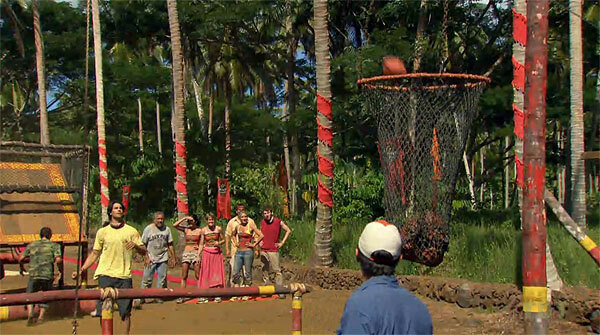 One person (Ozzy, Rick) chops through a rope, releasing a hopper of coconuts, then three people (Mikayla, Albert, Brandon; Ozzy, Keith, Semhar) shoot baskets until the weight of the coconuts drops the basket and raises a flag. 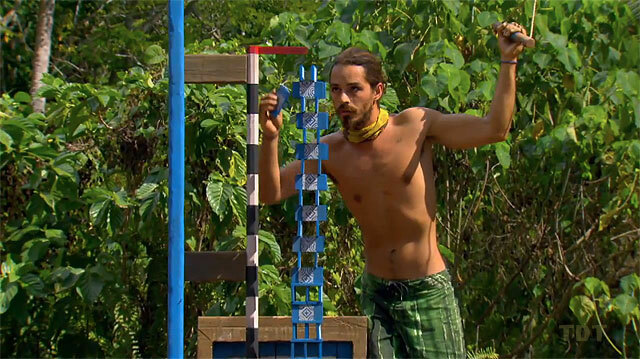 Upolu wins immunity, flint. 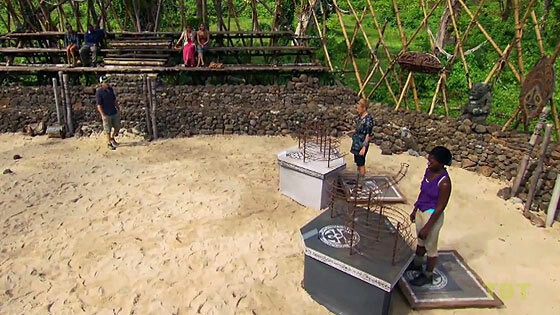 Ep1 IC: "Coconut Conundrum" - Upolu wins. 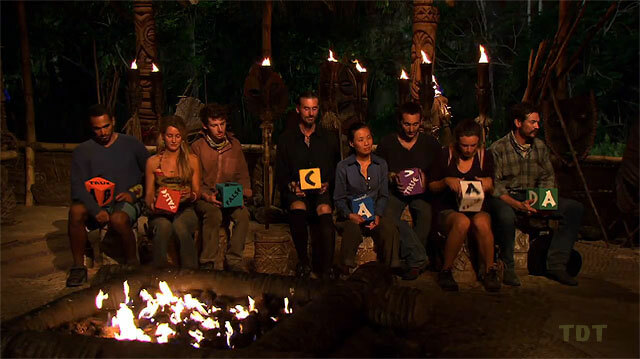 TC1 - Semhar voted off (8-1), goes to Redemption Island. 17 left. Edna sits out. Four people (the four Upolu women; Cochran, Elyse, Dawn, & Whitney) must untangle long ribbons from a tall pole, releasing a set of keys. These unlock the remaining four tribemembers, who must release a large crate from a slide puzzle. Once the crate is released, all eight members place it on a platform. 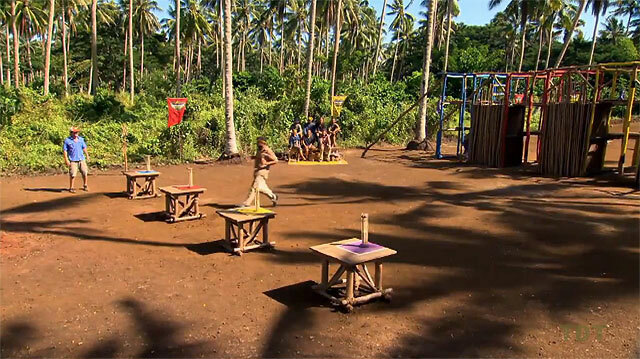 Savaii overcomes a substantial Upolu lead on the puzzle, wins immunity and comfort items. Ep2 RC/IC: "Crate Escape"- Savaii wins. TC2 - Christine voted out (4-3-1-1), goes to R.I., 16 left. In the first Redemption duel, Christine beats Semhar at pole stacking. Coach and Stacey, Ozzy and Elyse observe. Ep3 Duel: "Over-Extended" - Christine wins, Semhar out (1). Ep3: "Reap What You Sow" Ep4: "Survivalism" Ep5: "Taste the Victory"
Two contestants (Ozzy & Dawn, Brandon & Albert) take turns running along a floating dock, collect a puzzle bag, then hitch a ride on a body board that is attached to a rope connected to a giant winch/wheel. The remaining tribemates turn the wheel, hauling the bag collector bag to shore. Puzzle bags are then placed in baskets, that have to be brought to the top of a wall by two tribe members (Elyse & Whitney, Coach & Edna) with grappling hooks. The five puzzle bags contain long flags that form a tiki face when draped over the wall in the right order. 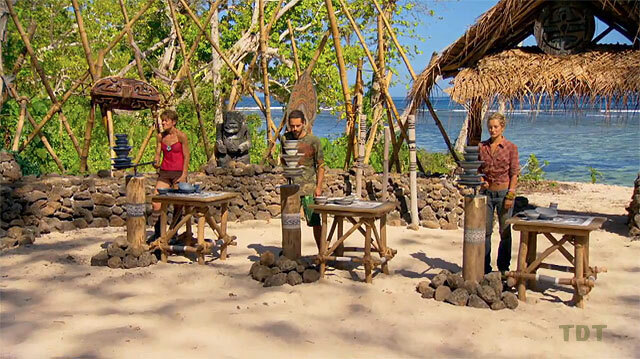 Upolu wins, gets coffee and immunity. Ep3 RC/IC: "Hitching A Ride" - Upolu wins. TC3 - Papa Bear voted out (6-1-1), goes to R.I., 15 left. Christine beats Papa Bear at tossing bean bags. Brandon and Edna, Cochran and Jim observe. Ep4 Duel: "Sandbagging" - Christine wins, Papa Bear out (2). Pearl Islands recycling: Dawn outlasts Stacey to win immunity and chickens for Savaii. Ep4 RC/IC: "Shoulder the Load" - Savaii wins. TC4 - Stacey voted out (7-1), goes to R.I., 14 left. Last seen in the Tocantins final three IC, Christine is better at grabbing balls than is Stacey. Mikayla and Albert, Dawn and Whitney watch. Ep5 Duel: "Simmotion" - Christine wins, Stacey out (3). Ep5: "Taste the Victory" Ep6: "Free Agent" Ep7: "Trojan Horse" Ep8: "Double Agent"
Upolu better gnaws off chunks of roast. 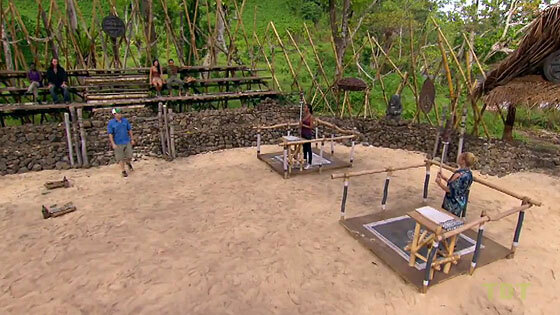 Upolu wins immunity, leftover spit-soaked pork. 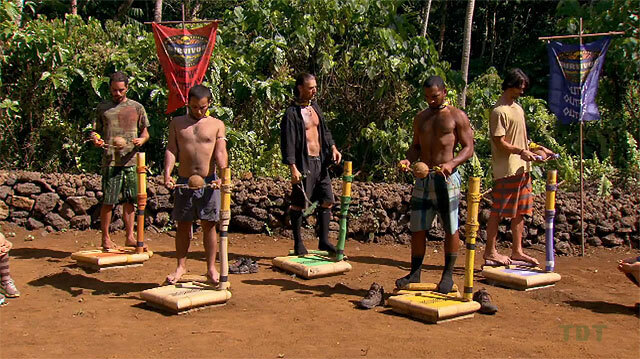 Ep5 RC/IC: "Pig Out" - Upolu wins. Christine beats Elyse in a rousing game of shuffleboard. Sophie and Rick, Ozzy and Keith watch. Ep6 Duel: "Lost in the Shuffle" - Christine wins again, Elyse out (4). In a battle of wheelbarrows and slingshooting coconuts at masks, Savaii wins. 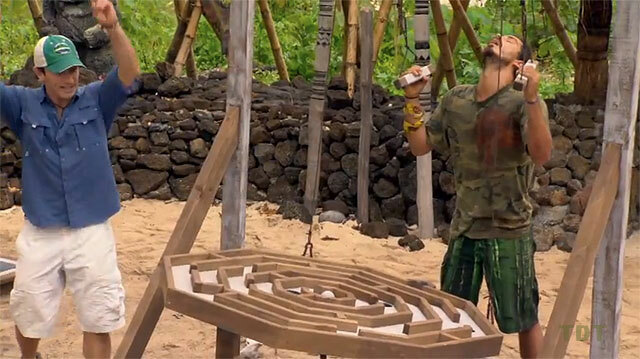 Ep6 RC/IC: "Losing Face" - Savaii wins. TC6 - Mikayla voted out (4-3), goes to R.I., 12 left. Christine and Mikayla use puzzle planks to make a bridge, then a puzzle. Christine wins again. Sophie and Albert, Ozzy and Cochran watch. 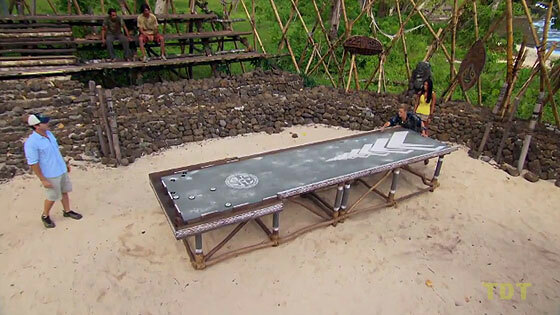 Ep7 Duel: "Game of Bridge" - Christine wins, Mikayla out (5). 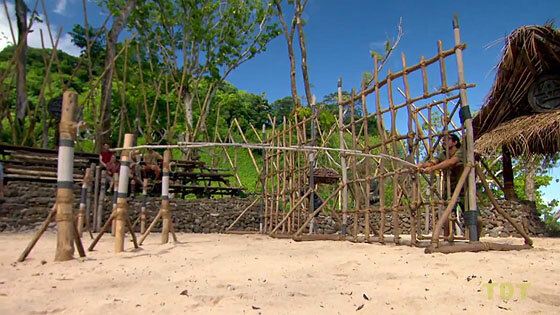 Ep7 RC/IC: "Family Ties" - Upolu wins. TC7 - Ozzy voted out (5-1), goes to R.I., 11 left. Ozzy shockingly beats Christine in a rehash of the first duel from S22. Both tribes watch, Ozzy re-enters the game. Ep8 Duel: "Jail Break" - Ozzy wins; Christine out (6, last pre-juror). Ozzy re-enters game, 12 left. Tribes merge, form Te Tuna. 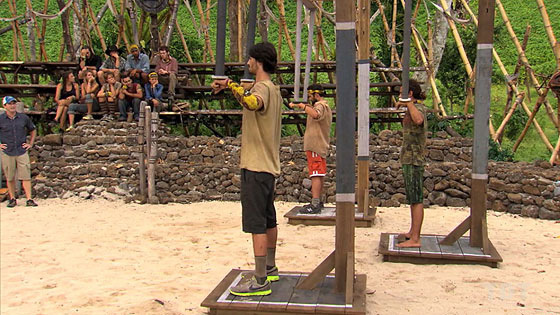 Ep8: "Double Agent" Ep9: "Cut Throat" Ep10: "Running The Show"
Contestants must stand on a narrow platform and hold up a coconut using two strings connected to two handles. After each round, the strings are lengthened, making the coconut harder to hold. Dawn wins for women, Ozzy for men. 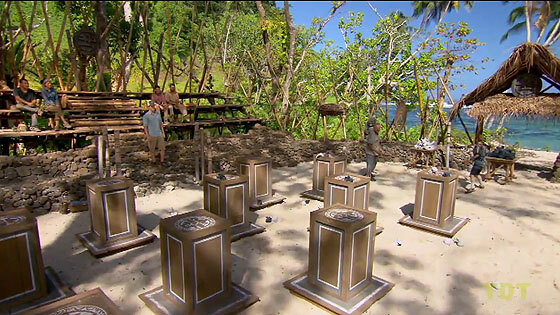 Ep8 IC: "Coconut Cradle" - Ozzy, Dawn each win immunity. 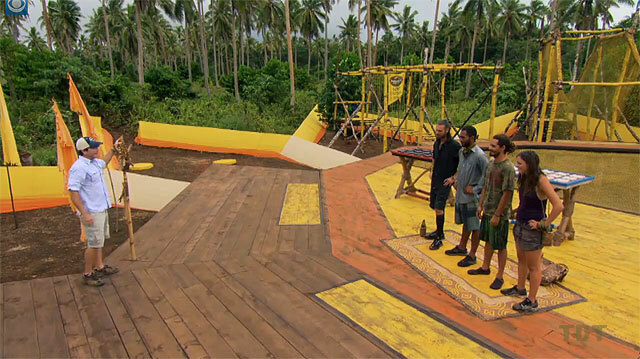 In the first round, the first four contestants to land a coconut in a small ring (Jim, Dawn, Whitney, Sophie) advance. 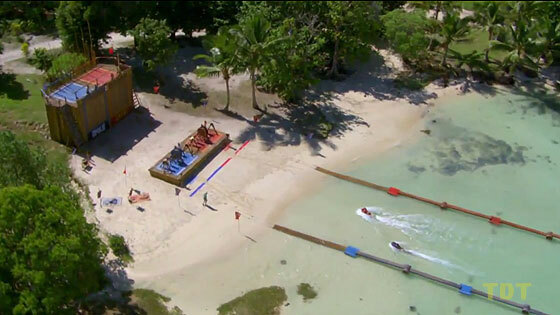 In the second round, contestants crack open a coconut, put the water in their mouth, cross an obstacle structure, then spit out the water to fill a tube. Jim wins, Sophie is a close second. Ep9 F11 IC: "Get Crackin'" - Jim wins. All Upolus plus Cochran opt to eat pastries and drink iced coffee instead of competing. Remining three Savaii must stand on a narrow platform, using a bow-shaped track to hold up a ball. Whitney wins. 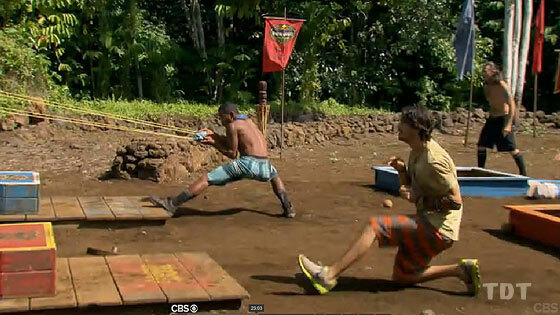 Ep9 F10 IC: "Bow-Diddley" - Whitney wins, while Upolu eats. Duelers must hold two poles, using the backs of their hands, that push against a board over their head. As poles drop, duelers are eliminated. Jim is out first (1st juror), Keith second (2nd juror). Ozzy stays alive. Contestants must cross see-saws while balancing bowls of rice on their heads, then pour enough rice into a final bowl to lower the seesaw and raise a flag. Sophie wins. Ep10 F9 IC: "Price on Your Head" - Sophie wins. TC11 - Dawn voted out (7-2), goes to R.I., 8 left. After Dawn is voted off, a second challenge forces contestants to answer trivia questions correctly or be eliminated. Sophie wins. Ep10 IC2: "C.A.T." - Sophie wins. TC12 - Whitney voted out (7-1), goes to R.I., 7 left. Ep11: "Cult Like" Ep12: "Ticking Time Bomb" Ep13: "Then There Were Five"
As in China, duelers must balance a stack of plates and dishes on a lever arm. Dawn is out first (3rd juror), Whitney second (4th juror). Ozzy stays alive. First three people (Albert, Sophie, Rick) to land three sandbags on three crates advance. In second round, contestants slingshot coconuts at large masks. Albert wins. Ep11 IC: "Second Chance" - Albert wins. Duelers must use a grappling hook to retrieve three ball bags, then use a ball to complete a hanging table maze. Ozzy barely stays alive, sending Cochran to the jury (5th juror). Then there's a family visit. Ozzy picks Coach's brother and Brandon's dad to join him on reward. 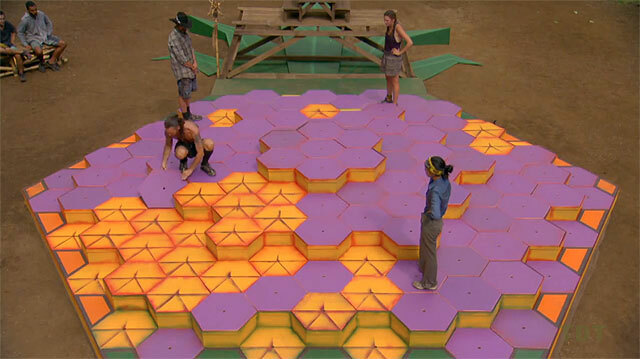 As in Borneo and Guatemala, contestants take turns flipping tiles, then advancing to an unflipped tile. When no unflipped tiles are adjacent, the player is out. Coach wins, Edna is angry. Ep12 IC: "Flip Out" - Coach wins. 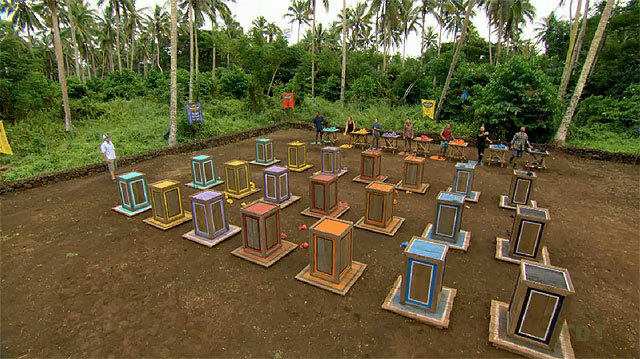 Contestants must stack four multi-colored cubes in a turning rack, such that no side of the rack has any two colors the same. Ozzy stays alive again, Edna is the sixth juror. 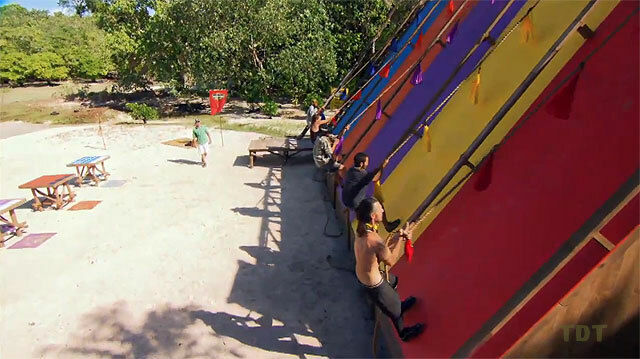 Using a rope, contestants must scale a steeply inclined wall to retrieve five puzzle bags. The bags contain nine sets of matching tiles, plus three that don't match, containing a lock combination. 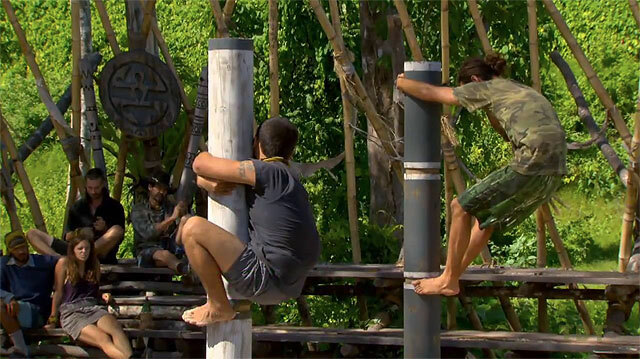 After matching the tiles, contestants must scale the wall, unlock the lock, and raise a flag. Brandon wins, thanks Jesus. Ep13 IC: "Batman Wall" - Brandon wins. TC15 - Brandon voted out (3-2), goes to R.I., 4 left. Duelers must hold onto a pole as long as they can. Ozzy wins the final duel, beating Brandon, and re-enters the game. Brandon is the seventh juror. Final Duel:"Get A Grip" - Ozzy wins, re-joins game. Brandon joins jury (7). 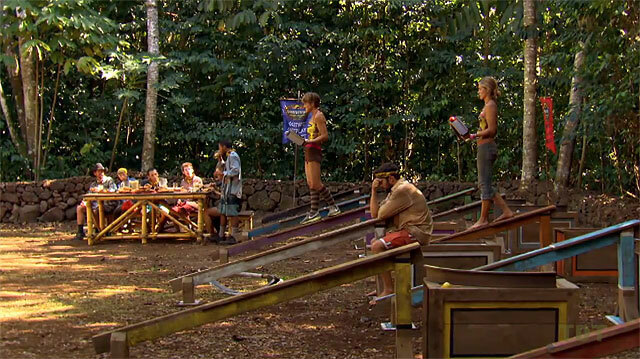 While one hand holds a balancing rope, contestants must build a house of cards on a see-saw. Ozzy eventually wins. Ep14 F5 IC: "Teeter Tower" - Ozzy wins. Ep14 F4 IC: "Lei of the Land" - Sophie wins. Sophie wins, 6-3-0 over Coach and Albert. Contestants arrive back home; inevitable facebook activity resumes.